The adjustable-mass (or adjustable-inertia) balance wheel offers several advantages over conventional balance wheels with fixed mass. Used in most contemporary Patek Philippe wristwatches and pocket watches, the adjustable-mass balance has also long been used in marine chronometers. regulator (which can introduce several kinds of errors into positions timing), and precise adjustment of the balance for daily rate without disturbing other adjustments of the watch. Glucydur. 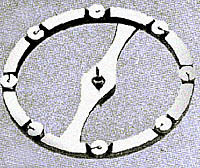 Eight small weights, slipped over posts are set down into the balance wheel rim as illustrated above. 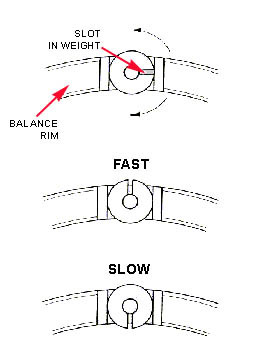 The weights may be rotated on their posts in opposing pairs to adjust the rate of the watch, or individually to adjust the poise (“balance”) of the wheel. The weights are sometimes also used in positional adjustment of the watch. As shown left, the circular weights contain a slot, which is the “light point” of the weight. If the weight is turned so that the slot is closer to the outside of the balance (away from the center), the mass of the balance is moved towards the center. This speeds up the rate of the watch (opposing pairs of weights moved equally) or decreases the effective mass of the balance at that point (only one weight turned). Conversely, rotating a weight so that the slot is closer to the center decreases rate or increases the effective mass at that point of the rim.